Imagine this magnificent bedroom set being the star of your home! This set is handcrafted from rustic cherry wood and is finished in OCS113 (Michaels) - the same as the picture above, resulting in a beautiful look that is versatile and is sure to be in style for decades to come! Select the finish as shown or choose one of our other finishes available for a better match for your suite. Save thousands of dollars by purchasing the set rather than buying each item individually - and with Free Curbside Delivery, your new items will not cost you any more money in freight! Four Poster King or Queen Bed Choose queen or king. Note the beautiful paneled wood and how the grain of the wood of the center panels are angled diagonally while framed in vertical and horizontal grains. This bed was designed and handcrafted by the Amish right here in the United States. The Amish are known for building products that last and this bed is no exception. Features bed rail assembly with poplar dovetailed slats. Dimensions: Head Board Height: 63.5" Foot Board Height: 30" Posts Height: 85"
62" Ten Drawer Dresser with Beveled Mirror This large solid hardwood dresser with detailed molding, features 10 dovetailed drawers with undermount slides. Dimensions: Width: 62" Depth: 22" Height: 42.75"
Chest of Drawers: This large solid hardwood chest of drawers with detailed molding, features 8 dovetailed drawers with full extension undermount slides. Dimensions: Width: 42" Depth: 22" Height: 62"
One Nightstand: This solid hardwood nightstand with detailed molding, features 3 dovetailed drawers with full extension undermount slides. 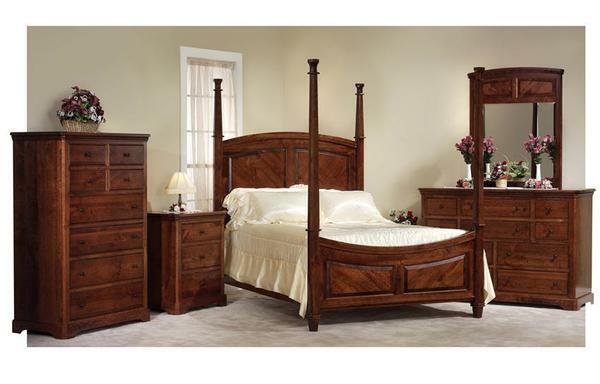 Dimensions: Width: 30" Depth: 22" Height: 34.88"
If this bedroom suite is not exactly what you are looking for or if you have any questions about it, please give us a call at (866) 272-6773 and our knowledgeable staff will be happy to assist you. We can add additional pieces or alter this suite to fit your individual needs.